This pot roast dish is a wonderful alternative to a classic pot roast. Cooked in the crock pot, this pot roast can be prepared the night before and cooked throughout the day, the result is an incredibly tender brisket served along with tender apples and carrots. The flavors of ginger and cloves are the perfect complement to savory beef and sweet apples. Serve with a glass of white wine and German red cabbage for the perfect winter dish! 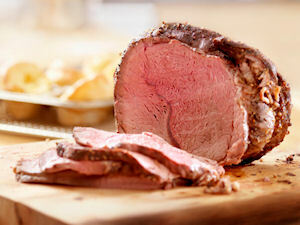 Prepare pot roast by trimming off excess fat. Lightly rub with vegetable oil and dust with salt, black pepper, and ginger. Insert cloves into roast. Place apples and onions into crockpot and place roast on top, cutting in half if necessary. Pour apple juice over roast and cover. Cook on low for 10-12 hours. Remove contents of crockpot to a warm platter, leaving any remaining juices. Turn crock pot to high. In small bowl combine flour and water to form a smooth paste. Stir into crock pot and cover. Cook on high until juices have thickened to desired consistency. Pour over pot roast.